Attend royal balls or rule with dignity when wearing the Noble Velvet Dress with Train. 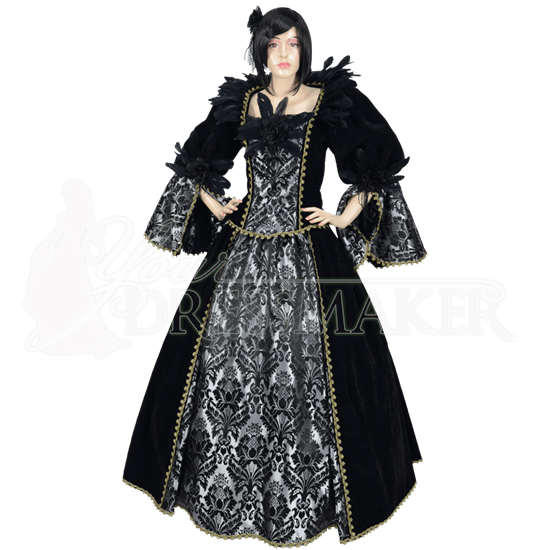 This handcrafted Renaissance gown is actually a two-piece skirt and bodice set! Both pieces are made of antique velvet accented with brocade. Luxuriously smooth, the black antique velvet has a refined look that befits a queen. The brocade front panels and sleeve drapes display an ornate pattern in silver and black. Lined with satin, the bodice has a square neckline and layered black feathers forming a dramatic stand-up collar. Feathers surrounding a flower form a unique embellishment at the bust, and golden ribbon trim frames the panels of this top. Lacing down the back secures the fit of this royal ball gown. The extravagantly puffed sleeves are gathered at the elbow, where they become brocade and drape open elegantly. The long skirt features a modest train in the back. Reveal its full volume, as shown here, by wearing it with our Medieval Hoop Skirt (MCI-146), sold separately.